The DNA inside of a cell is organized so that it fits well within the small size of a cell. Its organization also facilitates the easy separation of the correct chromosomes during cell division. The degree to which the DNA is tightly wrapped can also affect which genes are turned on or off, by affecting the ability of certain proteins to bind to the DNA. DNA is a large complex, composed of several building blocks, known as nucleotides. These nucleotides bind together to form strands of DNA. These strands can then pair, based on complementary sequences of the nucleotides. The pairing of these strands forms what is known as a double-helix structure. The double helix of DNA is then wrapped around certain proteins known as histones. This allows the DNA to be more tightly wrapped and therefore take up less space within the cell. The DNA can condense even further by the histones coming into close proximity to each other. This even tighter winding of the DNA causes the formation of tightly wrapped, or condensed, chromosomes. Throughout most of the life of a cell, the DNA is only loosely wrapped around the histones and is not in the condensed chromosomal form. The tighter wrapping, or condensing, of the chromosomes occurs only during mitosis, the process of cell division. During mitosis, the chromosomes condense so that each chromosome is a distinct unit. 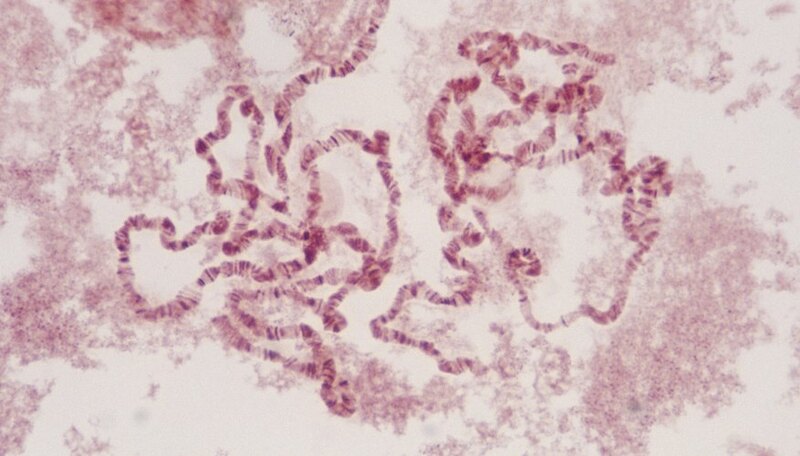 Prior to mitosis, the cell copies its DNA so that it contains two copies of each chromosome. The chromosomes align in the middle of the cell during mitosis, with the pairs of chromosomes next to each other. When the cell divides, one copy goes to each of the resulting cells. If the chromosomes do not line up properly, severe genetic abnormalities can occur, which can lead to death of the cell or cancer. Condensing the DNA into tightly packed chromosomes makes the process of chromosome alignment and separation during mitosis more efficient. Gene expression, or the process of a gene being turned on, is a complex process. It involves the binding of certain proteins, known as transcription factors, to the portion of the gene that regulates its expression. Most transcription factors promote expression of a gene; however, some transcription factors prevent a gene from being expressed, in other words, turning it off. Once a transcription factor turns a gene on, a protein called RNA polymerase moves along the DNA and forms a complementary sequence of RNA, which then becomes protein. 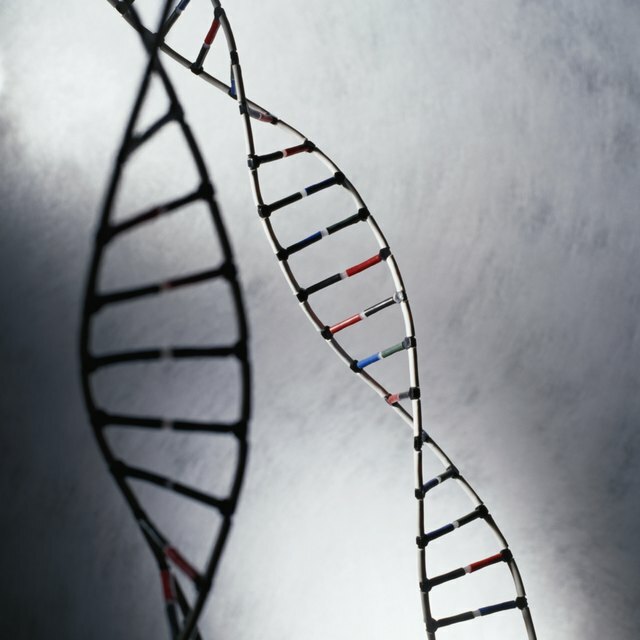 The way DNA is wrapped can affect gene expression, or which genes are turned on. When the chromosomes are tightly condensed, the DNA is wrapped very tightly, making it difficult for transcription factors to bind to the DNA. When the DNA is less tightly wrapped around the histones, the histones themselves can affect gene expression. Modifications, such as binding of phosphate groups, can occur on the histones and these modifications can cause the DNA to bind more or less tightly to the histones. Regions of the DNA that are only loosely bound to the histones are more accessible to transcription factors and RNA polymerase, making those genes easier to turn on. When the DNA is bound more tightly to the histones, however, it is more difficult for transcription factors and RNA polymerase to bind to the DNA, making it more likely that those genes will be turned off. Thompson, Noelle. "What Is the Advantage of Having the DNA Tightly Wrapped Into the Chromosomes?" Sciencing, https://sciencing.com/advantage-having-dna-tightly-wrapped-chromosomes-3546.html. 25 April 2017.